DAN Market Pots are designed for ORCHIDS to thrive. 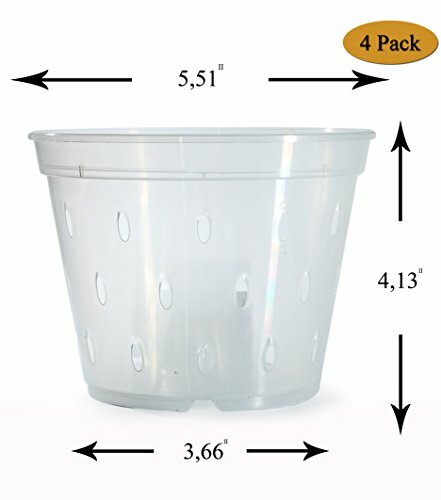 The durable construction orchid potting containers should provide years of satisfaction and successful results. Suitable for all types of orchids: phalaenopsis, cymbidium, vanda, anacamptis pyramidalis, platanthera bifolia, dactylorhiza maculata, paphiopedilum cypripedium, dendrobium, epipactis helleborine. CLEAR wide pots allow control the well-being of the ORCHID roots. DAN Market round orchid flower pots ensure PROPER DRAINAGE - pots have HOLES in the base and SLITS on the sides to increase drainage. Durable construction DAN Market large tall orchid pots should provide years of satisfaction with proper use. 5.5 inches diameter to 3.66 inches diameter at the bottom , height 4.13 inches . 4 Pack.